Get a handle on your finances for 2019 and early 2020 with Quicken Deluxe 2019 for $33 on Amazon. It’s a new year, new you, and maybe even a new handle on your finances, or at least it could be if you’re interested in today’s deal. 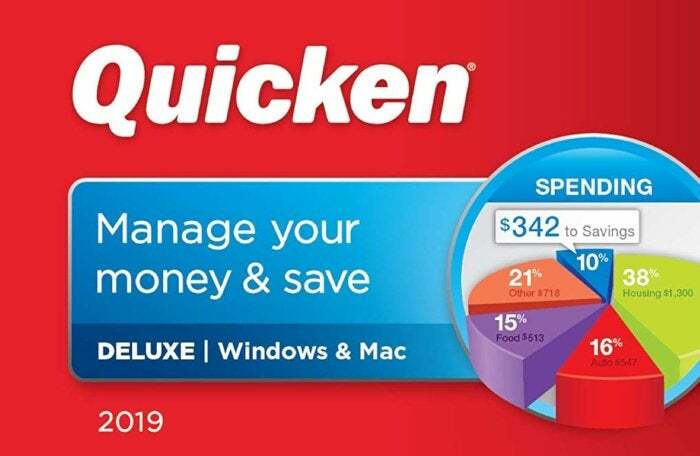 Amazon is selling Quicken Deluxe 2019 for $33 with an extra two months of Quicken membership for free—14 months total. Quicken 2019’s MSRP is $55, and it has been selling for that much or slightly lower since it came out in October. Amazon did have it on sale at its lowest price yet of $27.50 only yesterday, but at $33 it’s pretty close to that all-time low. The current sale price is available for both the boxed and digital download editions. Quicken Deluxe is one of the most popular choices for personal finance software. It creates a single location to monitor your various accounts including bank, credit card, investment, and retirement. It also lets you keep track of your bills and spending, create a budget, and view all that data on the desktop and mobile. Quicken says it uses 256-bit encryption to secure your data. Quicken also has features to help deal with your investments including return on investment analysis, capital gains tracking with export to Turbo Tax, asset allocation, and portfolio rebalancing. With 2019 taking the field, it’s likely the price for the new Quicken won’t go back up to the MSRP of $55, but it may not drop that much more save for the occasional sale.